If you think your fancy watch is accurate, think again. 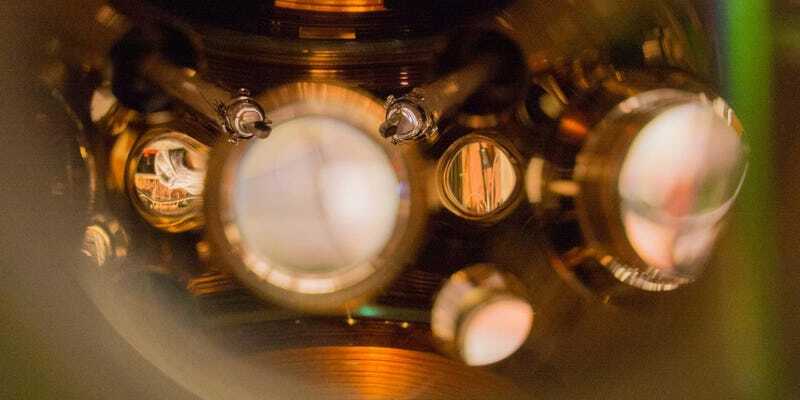 This atomic clock—the most accurate in the world—is now so finely tuned that it will lose a single second at most over the course of 15 billion years. The ‘optical lattice’ clock, developed by a global team of researchers including members from the National Institute of Standards and Technology, broke the record for clock accuracy a year ago. Now, though, it’s been finely adjusted to make it three times more accurate, losing less than 1 second over 15 billion years. That’s longer than the Universe has existed, by the way. All atoms have a particular and predictable vibrational frequency. Measuring that “tick” can be used to tell time—think of it as a tiny atomic pendulum, kind of. The world’s gold standard for time is the cesium fountain clock, which determines time based on the vibration of an atom of Cesium 133. That device can keep time with an accuracy of one second over 100 million years. Instead of Cesium 133, the record breaking optical lattice clock measures vibrations in strontium atoms using red laser light. (Incidentally, strontium ticks about 430 trillion times per second.) New tweaks—which include shielding it from electromagnetic radiation and are described in Nature Communications—have helped ratchet up the device’s accuracy. In fact, it’s now so accurate that it can easily measure the effects of time dilation with change of altitude that are predicted by Einstein’s theory of relativity. “Our performance means that we can measure the gravitational shift when you raise the clock just two centimetres (0.78 inches) on the Earth’s surface,” researcher Jun Ye told the Guardian. Top image by Marti/JILA. Second image by JILA/NIST/University of Colorado/PA.